I’ve been unwell. Still am, actually. Pneumonia. It’s a bit of a long-winded story, but in short it involves leaving a psychotherapy session early for the first time ever, thinking I was better when I wasn’t, and ultimately on Friday having to go see the doc urgently. I had just left a session, and on the train home I suddenly had this terrible pain in my chest. And it was a pain I had felt before; two years ago I had a pneumonia, and this was what it felt like. Anyway, once I got to the doctor’s, she had a good listen to my chest, took my medical history and told me she felt confident that what I had the previous week was more than likely a flu virus, but that I had milder symptoms than most, since I’d had the flu jab, and that despite this my immune system was compromised enough for me to develop a pneumonia. [Ironically, the reason I have the jab every year in the first place is so as to make sure I don’t come down with secondary complications, such as this..] Since I have a history of pneumonia, starting in exactly the same way [top right lobe a week after having had another illness] and because my asthma was kicking off like crazy, she decided that she’d rather start me on antibiotics straight away, than wait for test results to come through. 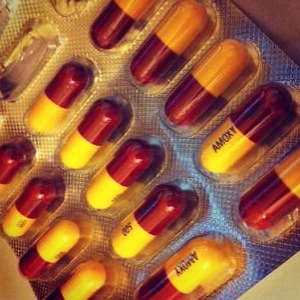 So, home I went, antibiotics in hand. Crashed into bed, and this is where I’ve been stuck up until just now. I have to say, antibiotics are a wonderful thing once they kick in. You really do feel so much better, very quickly. Of course there was always a chance that the pneumonia I had was viral rather than bacterial, in which case the antibiotics would have done nothing for me, but ‘thankfully’ it turns out that it must have been bacterial. While in bed I have been thinking about being unwell. It’s something I have a fair amount of experience with. You see, I have a really poor immune system, and so whenever something’s going ‘round, I tend to catch it. I mean, I had swine flu long before it became fashionable. But, also – as I have mentioned in previous posts – I am prone to what I call psychosomatic fevers. Other people get upset tummies when they are stressed out; I get a temperature. And this is what’s been on my mind, these last few days; the relationship between having a genuinely poor immune system and getting psychosomatic illnesses. You see, I don’t think it is entirely chance that I get ill very easily, weak immune system aside. When I was little I was always seen as someone who could look after myself, someone who was responsible and dependable and able, far beyond my years. My parents tended to assume I’d be OK on my own, and mostly I was. I’m sure it was sometimes hard for my parents, this fierce independence I had; not so easy parenting a child like that. But, at the same time, they were very busy people; three other kids, one of whom really rinsed them clean of any energy they may have had. So, as confusing as it may have been for them, I’m guessing it was also something of a relief that I didn’t seem to need much looking after, that in fact, I was perfectly able to look after myself as well as anyone else. But, when I was unwell, it was almost as if my parents’ parenting instincts suddenly kicked in, as if this was the kind of parenting they could understand, could relate to. After all, they are both trained in healthcare professions. This was something they knew what to do with. And so, as a consequence, when I was unwell, those were times when I truly felt like a child, like they were my parents and I was in their care. At all other times I always felt equal to my parents. I always felt like I was an adult, just like them. And to a large degree, I think that’s how they and other adults around me saw me, too. But when I was sick, well, I could allow myself to be the child I really was. So, is it so strange that I am prone to getting ill? Even now, as an adult, when I am ill, both of my parents will call me, will want to know how I am, will maybe even worry a little. This in contrast to other times, when I am nearly always the one to call them, nearly always the one to ask what’s going on for them. Of course, something like pneumonia is a very real illness, it’s not psychosomatic, not imagined, not exaggerated, but in the midst of feeling so terribly poorly, I also do feel cared for, in that very special way. How I’ve kept myself busy. 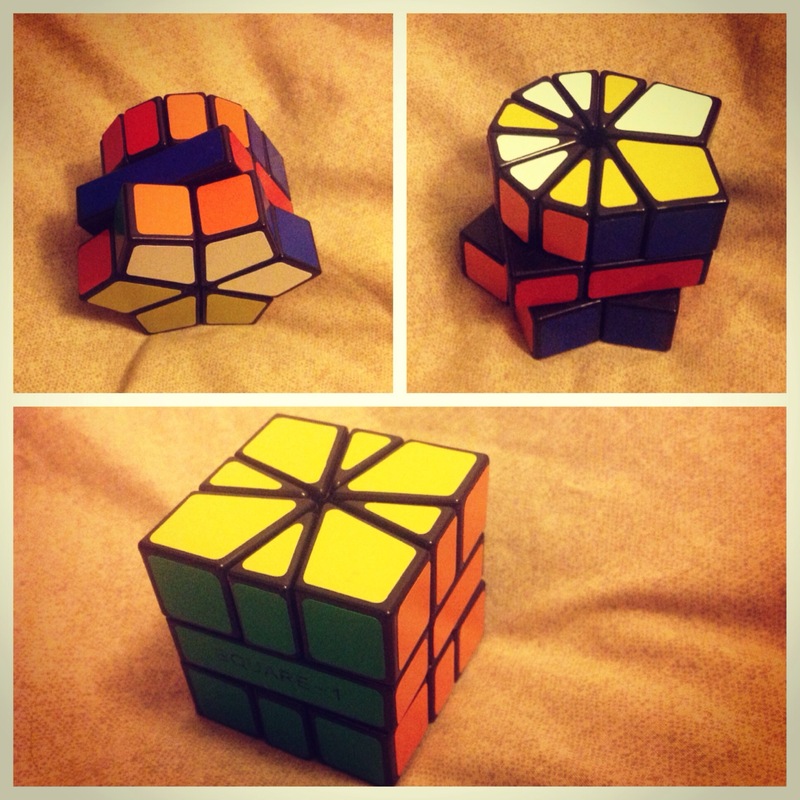 The Square-1 cube puzzle. It’s a fair challenge, getting it back into a cube shape, and then getting all the colours right. Yesterday I was feeling a bit down. Save the day I was told I can’t do psychotherapy it’s been a while since that happened. It just kind of came over me when I got in from work. Some sort of heavy, foggy sadness that I couldn’t quite make sense of. Initially I felt ever so slightly panicked by it. Not only because it came on so suddenly, but because my first thought was naturally Am I getting worse again? But then I sat down on the bed. With my tiny green backpack still slung over my shoulder and my Doc Marten clad feet dangling over the edge, I probably sat like that for about ten or fifteen minutes, trying to stay in the moment, doing the exact opposite of what I would normally do; I allowed the feeling to just wash over me, engulf me, and although I didn’t actually cry I felt like I could have. That probably doesn’t sound like much to you. But to me that’s absolutely huge. The last time I cried was in November last year. Around my birthday. With my sisters and some very close friends around. Before that was August 5th. A year ago today. This time last year was my last evening in Sweden before returning back to London. I had had a really lovely time. I’d collected a lot of happy memories. I’d done things I’d been looking forward to all year. And then it all fell to pieces. I had a long conversation with my mum that night. About a lot of things. About the reason why I had chosen to spend so much more time at my sisters’ than at my mum’s house. About the fact that I feel my family don’t understand how incredibly difficult it is for me to know that whenever I go home it means I’ll have to put up with seeing my oldest brother. How near impossible it is to go back to playing the role I’ve played for so many years of my life. The Everything Is Fine role. The Of Course I Understand How Hard It Must Be For Everyone Elsegame. To pretend that the non-verbalised Can’t You Just Get Over It? attitude doesn’t get to me. That night, a year ago, I tried my very best to explain it all to my mum. I tried as hard to explain to her as she tried to understand. But, unfortunately, the two didn’t meet. It’s very hard to write this. I keep wondering if I’m being unfair, if I’m being too hard on my family. But, I guess, in short what happened during that conversation – even though I didn’t come to realise it until several months later – was that I understod that I simply can’t move on as long as I’m tied to my family the way I have been. That the chains can’t be replaced by loving ribbons until I find a way to heal. And that I can’t heal unless I allow myself to feel how I really feel, both about what actually happened – the abuse – and the way my family has (or rather hasn’t) dealt with it. And, probably most importantly, how I feel about them. Each one of them. Individually. Because, the truth is that right now I can’t honestly say how I feel about them. I love them and I hate them and I care and I don’t care, and it keeps changing all the time. And I need time to figure it out. Figure out what they mean to me, and what I mean to them. All of these things I was thinking about yesterday, sitting on the bed. And it dawned on me that maybe this is it. Maybe this – me sitting on the bed, just feeling – means that I am coming closer to healing? That feeling sad, or angry, or scared, or confused – maybe that’s a sign that my journey back to myself has finally begun. I have no illusions. I don’t for a second think that dealing with my complicated feelings will be easy. I know that it will be damned hard work. But – and I’ve said this more than once – I don’t think it’s meant to be easy. It’s meant to be worth it.